If you’re a woman of God I’m pretty sure you’re aware that God desires us to walk in modesty. It’s often a difficult thing to do when society is on the extreme opposite end of the spectrum. From racy advertisement to movies that promote promiscuity it’s a challenge to uphold the modesty guidelines from the bible. But is modesty only subjected to what we wear? Absolutely not! In this blog post I will discuss other areas of our lives that Christian women and even worldly women should apply modesty. When we are slow to speak and make it a habit to speak kindly and with love we are indeed practicing modesty. I myself struggled with speaking in a crude manner when talking with close friends as well as snapping at people who hurt me or made me angry. This is not the way Christ wants us to speak to others, no matter what. Yes, we are to be bold when sharing the gospel, but that doesn’t give us the green light to say whatever we want, how ever we want. This includes reframing from conversations deemed unsavory. Always use your Jesus filter before speaking and before long your verbal communication will reflect modesty. Remember what goes in must come out so be mindful of what you are reading so that you remain a good example of an ambassador for Christ. Again this goes hand in hand with the things you read. If you are watching television shows, music videos, movies, YouTube videos, and SnapChat posts you wouldn’t dare view if Jesus Christ was in the same room you’re not demonstrating modesty. If you keep watching these things sooner or later it will begin to affect your behavior just like the things you read. In my opinion this is one of the biggest issues we are dealing with in the Body of Christ. Unfortunately, there are Christian women who don’t find issue with watching Beyonce perform at the MTV Music awards or viewing a music video by Katy Perry. Regardless of their talents these women have an agenda to promote extreme feminism, self worship, and overt sexuality among other worldly things. That's what they are paid the big bucks to do. The outward appearance of these celebrities and how they carry themselves has crept over into the church resulting in Christian women wearing in-modest clothing, Jezebel make-up, seductive hair styles, and having ungodly attitudes. Don’t believe me, just scan through some of the Instagram posts by self proclaiming women of God then get back to me. What's sad is when these women are called out for their immodesty they become quite defensive and begin justifying why it's okay. Remember this is what the enemy wants; to have us convinced in our minds that what we are doing is acceptable to God when it's not. Without a doubt one of the most controversial ways to show modesty is with our outward attire. Many people have their personal convictions in regards to what is considered modest dress. Some prefer the Amish approach while others wear fashionable long dresses and skirts without head coverings. Although, we may never completely agree on a universal dress code for women it's hard to ignore wearing booty shorts that resemble underwear and sports bras worn as tank tops in public are not good examples of modest attire. Felt at least a tiny bit convicted about putting that on. You know what you are wearing is provocative, but you don’t care because you want the attention and or compliments. Either way, God is going to judge your heart in the matter to include your true motives and at this point it is not lining up with the word of God. God understands by our fleshly nature most people will judge the outward appearance before anything else which leads us to why He asks we take into consideration how we dress as women. 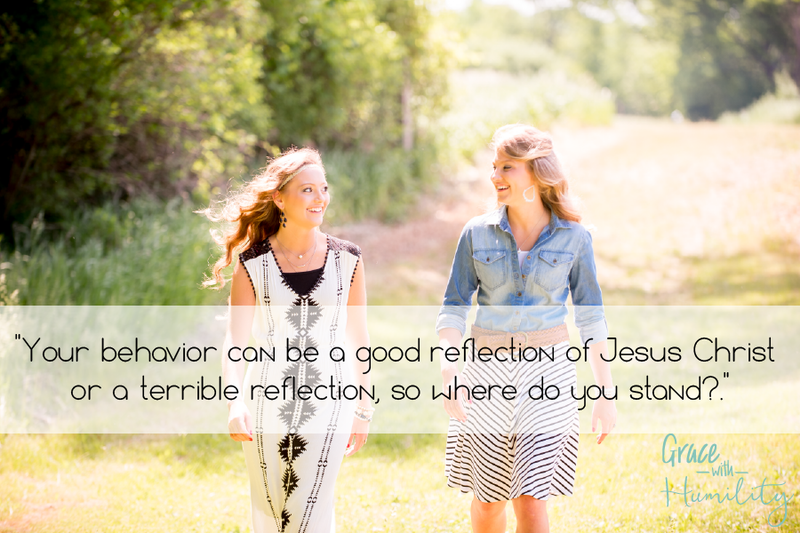 Your behavior can be a good reflection of Jesus Christ or a terrible reflection, so where do you stand? Conducting yourself in a loud, obnoxious, gossipy, rude, foolish, or narcissistic manner is not an example of modesty. We are to be meek, kind, gentle, wise, and loving rather than a train wreck waiting to happen. Your actions speak volumes when you step out into the world. People are always observing you even if you don’t realize they are including your children. As a Christian woman you are an example of our Lord and Savior and your behavior can either encourage someone to come to Christ or have them turn the other way. Stop showing out all the time and begin implementing the Fruits of the Spirit through your behavior even when people test you. Lastly, we live in an extremely materialistic world. From the cars we drive to the handbags we own many of us strive to live a life of luxury even if we can't afford it. Now, I'm not saying by any means you can't have nice things, but if you're working hard and hustling only to accumulate material possessions it's time to check your heart. When you acquire wealth while living a modest lifestyle you can actually be a blessing to others. The bible is pretty straight forward about the importance of blessing those in need, but how can you do that if you spend every dollar you have on trying to keep up with the Joneses? Let me tell you a little secret I learned from reading the book The Millionaire Next Door. The Joneses are actually broke and the majority of millionaires are able to pass down their wealth to their children because they don't blow their money on frivolous things despite what the media leads you to believe. They live a quiet, modest lifestyle. Not only that, but regardless of their personal beliefs in God they are able to sow into charities, foundations, and the lives of others because they don't spend their money trying to show boat like the Joneses. Jesus Christ is Lord of all lords and never lived his life as the kings and those in power do today even though he had access to the resources. I believe there are many lessons about the modest, humble lifestyle he lived. There is true humility in his story and aren't we to resemble his walk? Accept it or not, competition amongst women is fierce. We often attempt to prove we are superior to other women through the items we purchase like expensive cosmetics and fashion accessories as well as job and career titles to name a few . Little do we know we can become a stumbling block for a women who is struggling to keep food in the refrigerator and who may not have the means to buy name brand clothes or enjoy weekly nail salon visits. Our stuff does not make us superior to her nor does it help get us into heaven. If we take modesty into consideration when making purchases not only have we removed ourselves off pedestals, but we are reinforcing the values set for Christian women. So, the next time you feel the need to purchase the newest $15,000 Hermès Birkin handbag, remember $15,000 could have been sowed into the lives of others. Please share in the comments below areas in your life where you struggle with modesty.